I first met Adrienne about 7 years ago when she was 36weeks pregnant with her twin boys. She came into the bookstore I was working in, looking for a novel that required little concentration. We started chatting and over the next few years, caught up quite regularly. We're both writers and it was a pleasure to meet someone with the same love of words. She told me, way back when her twins were still in the belly, that she was working on a novel. Fast-forward to Sunday just gone and in that same bookstore where we met, she launched Watercolours - her novel that she so often refers to as her "10 year baby." The narrative is superb, the characters so well-developed, and her descriptions of a small Australian town are absolutely wonderful. I'm so inspired by her talent and ultimately her desperate need to finish the story of the boy she dreamed up so long ago. Her husband, actor Rob Carlton (who recently played Kerry Packer in the ABC mini-series Paper Giants), introduced Adrienne on Sunday, and spoke of her passion for the written word and her unwavering dedication to the project. Lack of time, motherhood and editorial criticism didn't stop her mid-sentence. She just kept going till the tale was told, with many a late night spent tapping away. And now, lucky for us, we can delve into the story of artist-genius Novi and the small town of Morus where he spends his childhood. The lovely people at Harpercollins 4th Estate have given me two copies to give away and Adrienne has promised that she'll sign them before I send them to the winners. Please leave a comment below and I'll draw a winner next Tuesday 24th May. Read on for a fascinating interview with the writer herself. Jodi: Do you remember where you were when Watercolours first came to mind? Adrienne: On the Island of Lipari, in Sicily! I was on a backpacking holiday after uni and having the most wonderfully luscious time, climbing volcanoes and eating bags of fresh figs. The character of Novi came to me first, a boy with a gift for art and an obsession with drawing the people around him. I thought it would be interesting to see what would happen if a particularly sensitive and observant child drew pictures of his community and its history, how the results might come across as spooky or even threatening to the adults around him with something to hide. Jodi: You refer to it as your "10 year baby." What kept you motivated in that decade? Adrienne: Friends and family were very supportive, and I’m very grateful for their encouragement. Ultimately though, I loved the story - especially the Australian silk-growing history I uncovered during my research and I just had an unwavering urge to share it! I became quite fond of the characters, too; I liked hanging out in the town I created, so this kept enticing me back to my desk. Jodi: You admit that writing can be a lonely business but you managed to create characters with so much depth. Did they ever feel completely real to you? Adrienne: On some level they took on a life of their own, and inhabiting them gave some unexpected depth to my life during the period I was writing the book. For example, sometimes I’d be reading the paper and come across an article that would normally be of no interest to me, but I knew it would have an impact on one of my characters and so it made me sit up and take notice. The Business Section took on a whole new level of significance, as did the local rag! But the character of Novi, the story’s eleven-year-old protagonist, was the character I related to most deeply because his story is of one of becoming an artist. When I started writing the novel I had no idea what I was doing, but writing - like art and music and all creative processes - are really quite similar, involving struggles with inspiration and self-doubt, self-discipline, loneliness and exhilaration. It’s quite a rollercoaster! Novi’s journey felt similar to my own and this gives an authentic emotional anchor to the book. Jodi: How did the map of Morus help you in the writing process? Adrienne: My wonderful artist friend, Rachel Couper, sketched a big map of my fictional town on butcher’s paper, with the river and the sea, the highway and streets and all the character’s houses set in place. This allowed me to keep the physical landscape in my head, to picture my characters in action, moving around town and the different routes they took. She also helped me draw a storyline map, a visual representation that captured all the strands and elements, how they intersected and where the climaxes were – this was incredibly helpful because I felt at times that I was drowning in text, in piles and piles of pages. Having something visual up on the wall allowed me to quickly navigate where I was up to in the story and to fix the setting in my mind. Jodi: What was the most enjoyable part of the writing journey for you? Adrienne: With each draft, the feeling that the manuscript was getting better. Editing notes can be confronting, but once you get over the demoralizing fact that more work needs to be done and start incorporating the suggestions that feel right, very quickly you see how much your manuscript is improving, and that is so exciting - it gives you a whole new burst of energy. Jodi: What was the most challenging? Adrienne: Juggling motherhood with writing. The two can seem at odds with each other and I often felt wrenched in two directions. My husband’s career had taken off and he was busy and away from home a lot - it felt like there was no time or energy for my own creative work. It’s not an easy phase of life, but parenthood does make you efficient with your time and it forces you to sort out the things that are most important. I had to carve out time for writing, and when I did I was much more content. When the twins started school I suddenly found balance again and I couldn’t believe how much progress I could make in a week. Jodi: In one sentence, describe what Watercolours is about. 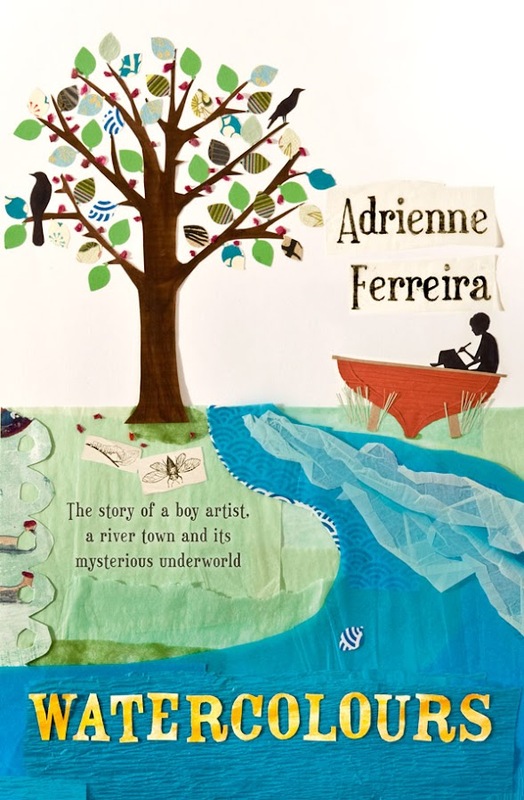 Adrienne: A small town mystery steeped in a vivid Australian landscape, where love and good intentions triumph. Jodi: Any plans for another novel? Adrienne: My next novel is set in Avoca Beach, about a lonely young mother who becomes obsessed with a sailor watching her from a coal bulker moored just outside her cliff-top house. It’s a story of youth, aging and the discomfort of transition. Jodi: For all those writers who dream of completing a novel - what is your advice? Adrienne: Start now, because it will take you longer than you think. And don’t worry about getting it out perfectly in the beginning, there’s plenty of time for editing, and some of the best stuff comes out in raw form. Just harness your energy to your ideas and let them fly! It's so lovely how the connections have kept on going between the two of you. Will be keeping my eye out for this book so I can read the words beyond this beautiful cover. you have so many cool friends, cool lady. A great interview and a story that really draws you in. Today we had some bad news that relates to our family. That did come from a small country town on a river. Trying to put the puzzle together. Often fiction can do this so succinctly and with the imagination there is healing. It looks and sounds amazing - and I love the fact that you've kept in touch for such a long time. Sounds fantastic :) How lovely for you to have the "author-experience". this was very interesting and cool that you have a link with the author. Love the cover too. sounds great - so encouraging to hear stories of long held baby books coming to light at last! Sounds so interesting, I'd love to get wrapped up in a magical story like this. Thank you to the two of you! xo m.
that sounds like an intriguing story...I'd love to read it. Great interview Jodi. I do understand the comment about the local rag (We're quite proud of it). I have always worked for local rags and now, as some people know 24 of Sydney's local rags and every day I am delighted and surprised by the stories they tell. They're above and beyond what a metro could every find the space to share, nor the inclination to share, I think, and these stories are true. They're often better than fiction and I adore being able to tell and share these stories. In fact, when I read the recent blurb for Watercolours, it was that sense of community and the tales therein that appealed. I'll have to track down a copy. Thank you so much for that fascinating conversation! I love the idea of her creative collaboration with her artist friend Rachel Couper. Just the cover alone would have made me pick up this book; now I can't wait to get my hands on a copy. Sounds like a wonderful book, fingers are crossed! A wonderful interview, and I love the cover of the book, stunning! What a wonderful sounding story. Adrienne is such an inspiration for focussing on her dream and making it come true, even when life sometimes got in the way. This book sounds so intriguing and looks so beautiful. And you are a wonderful interviewer! I have a good friend who's been working on a novel for five years. It's nice to see that the hard work of writing pays off. Jodi, you write too right? Could you share some of your tips and anecdotes about freelancing? Great interview Jodi- thanks for the insight into how a novel comes together, written by someone with a real life! My grandfather's family comes from Lipari, I loved Adrienne's description of travelling there (sigh, very jealous!). Looks like a great read. this book sounds so lovely, thank you for telling us about it! also, your health-care system sounds wonderful! It looks like a truly beautiful book.